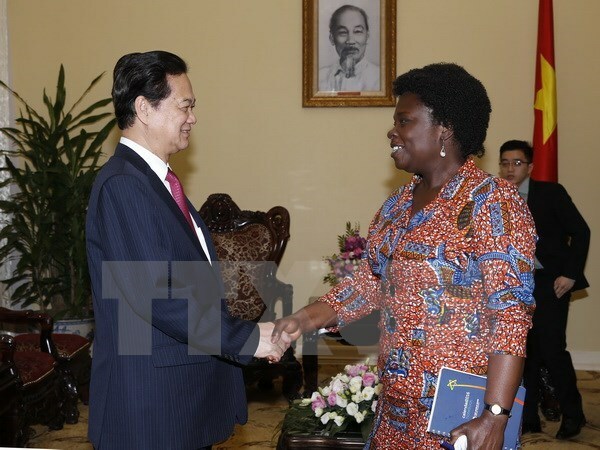 Hanoi (VNA) – Vietnam wishes for continued support from the international community, including the World Bank (WB), to fulfill its development goals, Prime Minister Nguyen Tan Dung told WB Country Director Victoria Kwakwa during a reception in Hanoi on March 30. He asked for the WB’s support in resources, policy consultation and technical assistance in infrastructure, sustainable poverty reduction, health care, education-training and human resources training, as well as in response to climate change and rising sea levels. The host expressed hope that the WB, with its prestige, will continue raising its voice towards the effective and sustainable use of the Mekong River resources, especially waste. The leader also spoke highly of the outcomes of the WB President Jim Yong-kim’s visit to Vietnam last February and the joint work done to build the report “Vietnam 2035: Toward Prosperity, Creativity, Equity and Democracy” covering specific recommendations for Vietnam’s development orientations. Kwakwa, for her part, said the WB is working closely with Vietnamese ministries and agencies to effectively realise commitments reached during Jim’s visit and goals set in the Vietnam report. The WB pledges to liaise with partners in seeking a suitable roadmap for Vietnam to achieve priority development goals and ensure the State budget’s sustainable solvency, she said.